I am interested in exploring ideas related to beauty, popular culture, and kitsch. Can You Dig It? A Chromatic Series of Floral Arrangements is a series of photographs taken of floral arrangements that I have created. This series consists of 30” x 40” digital photographs printed on metallic paper. Part of my artistic practice is collecting objects to photograph from 99 cents stores. These ‘fake’ flowers used were gathered from various 99 cents stores found throughout New York City and New Jersey. The backdrops are made out of polyester spandex. Creating each picture has been fun. Quite often, I am surprised by how an arrangement translates into a photograph. Each is an exploration of a specific color such as pink, orange and purple. Some utilize contrasting colors. These photographs challenge notions related to what is natural and artificial, what is considered to be beautiful and what is considered to be tasteful. By using a low tech camera and lighting, I address this concept of high/low art and the idea of the well-crafted photograph. Can You Dig It? 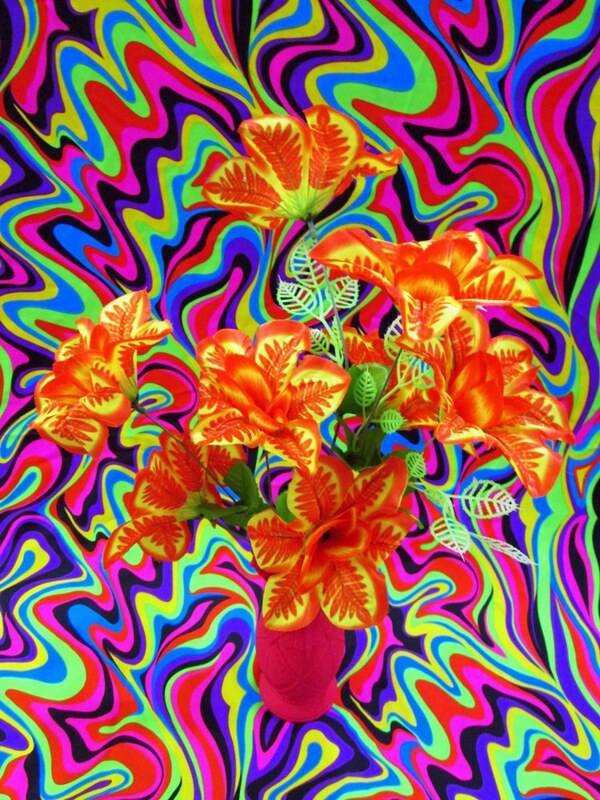 A Chromatic Series of Floral Arrangements explores the broad spectrum of colors/hues that exist. This project is also influenced by my love for funk music and all things funky. Melissa Eder received an B.F.A. in painting from Parsons School of Design in New York City where she studied with Sean Scully, and a M.F.A. in combined media from Hunter College in New York City where she studied with Robert Morris and received a Meritorious Award from the Alumni Association. As a visual artist, her work has been shown nationally and internationally in such venues as the Bronx Museum of the Arts, New York University’s Broadway Windows Gallery, Art in General, the Charlotte Street Foundation’s Paragraph Gallery in Kansas City, Missouri and in Stadtlengsfeld, Germany where she created a permanent art installation in a former kindergarten. She was an artist-in-residence at the Henry Street Settlement in New York City, the Saltonstall Foundation in Ithaca, New York and the Atlantic Center for the Arts in New Smyrna Beach, Florida as selected by photographer Graciela Iturbide. In 2011, her work was selected by Eric C. Shiner, the director of the Andy Warhol Museum for his curated exhibit on CurateNYC. Recently, her photo book Fave Foods was included in a group show at the Davis Orton Gallery in Hudson, New York. She has received numerous grants including funding from the Puffin Foundation and two Manhattan Community Arts Fund grants from the Lower Manhattan Cultural Council. She was an artist-in-residence at the Henry Street Settlement in New York City, the Saltonstall Foundation in Ithaca, New York and the Atlantic Center for the Arts in New Smyrna Beach, Florida. Her work has been reviewed by the New York Times and various other publications. She lives in New York City and works in Brooklyn as an artist in residence through the chashama studio residency. She was born in Long Branch, New Jersey.